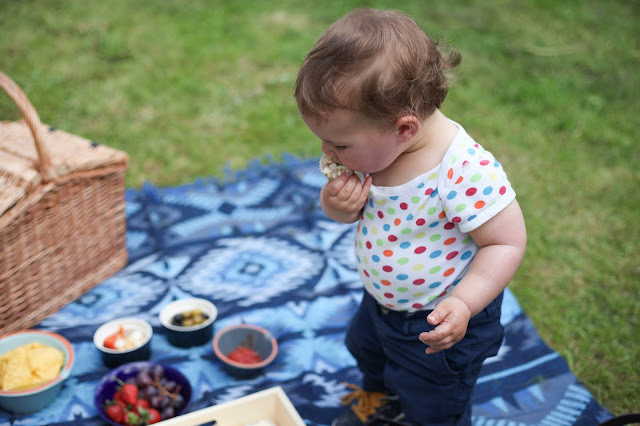 Rejoice for Picnic season and eating Al fresco is upon us and it's something that is very much apart of what summer means to us as a family. Having grown up in South African, a outdoor loving country with a huge bbq culture, it meant I spent many warm evenings sitting outside enjoying good food and it's something I try to recreate here in the UK at every opportunity and this week we took full advantage of the dry weather and enjoyed our first picnic of the year. 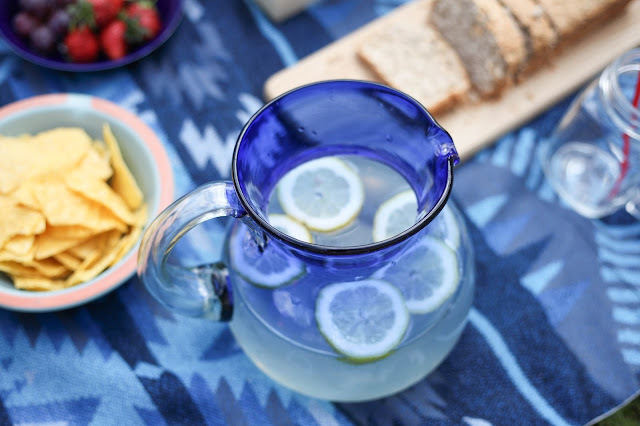 Al Fresco eating should be all about celebrating what is in season and it's time to get colourful with bowls of beautiful fresh fruit, homemade salsa's and cloudy lemonade. Wether a picnic or having friends around setting the scene is key, although you really don't have to spend loads to make eating outdoors a cosy and comfortable affair. I recently popped into HomeSense which have a huge array of outdoor accessories and furniture and found this amazing Mexican recycled glass jug, some pretty bowls and ramekins perfect for filling up with olives and hummus, as well as a wicker panic basket and long wooden serving board and I am sure all of these things are going to see us through this summer and thought I would share my top tips for the perfect picnic. 1. 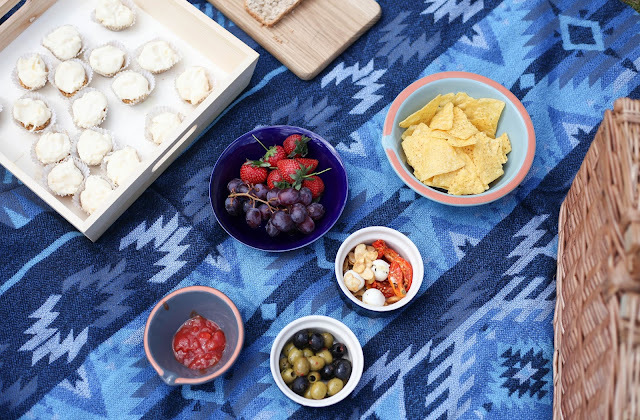 Set the scene - eating outdoors is a wonderful thing to do, wether a gathering of friends or just family it's the little details that make it really special such as a pretty picnic blanket or plates and napkins. If your planning an evening meal outdoors then pop in a few tea lights into your hamper to make things really nice and cosy. 2. Tapas style food - finger foods are a must at a picnic especially if your catering for kids who will want to graze on food while playing in the sunshine. If your having a larger group of friends it also means there will be something for everyone and it doesn't need to take a lot of work - simply stock up on quick snacks such as olives, feta, sundries tomatoes, corn chips and dips. 3. 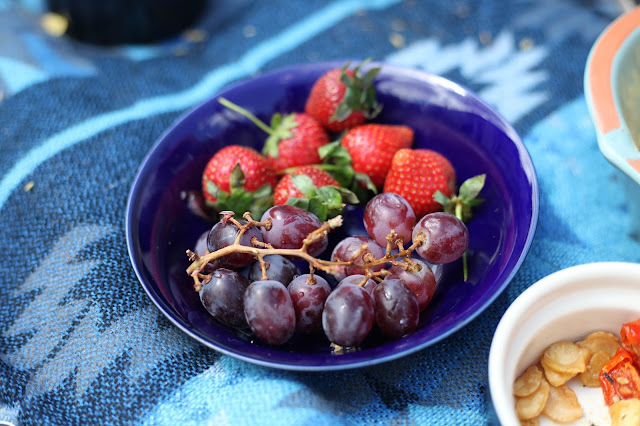 Celebrate the season - summer is all about big juicy strawberries, grapes and blueberries so do take advantage of the wonderful fresh fruit on offer and is also perfect for little ones to pick and choose some healthy treats. 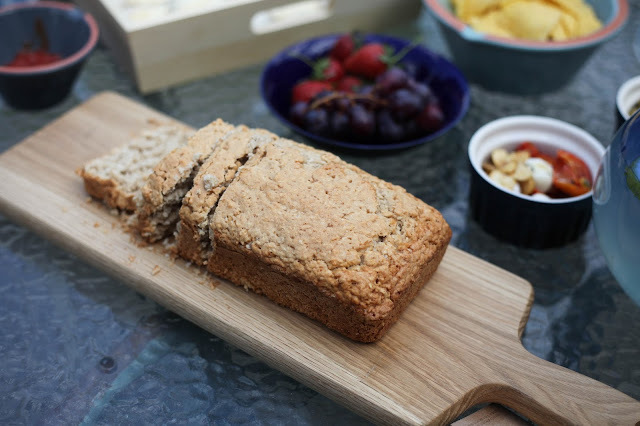 What I also love about family picnics is the opportunity to create something a little new to try out and thought instead of going for my fail safe banana bread which is very popular in our house, I would try making a Sweet Coconut bread, which was so delicious and full of goodness it may of become our new favourite treat. My recipe as been inspired by Shivi Ramoutar out of Caribbean Modern, I've made a few changes to keep it as quick and simple as possible. 2. In a large bowl, mix together the flour, desiccated coconut, sugar, baking powder and spices. 3. In a separate bowl whisk together the egg, coconut milk, vanilla essence and melted coconut oil. 4. Slowly fold the liquid mixture into the dry ingredients until there are no dry patches (if you need to add an extra splash of coconut oil then do so). The batter should look similar to cookie dough and make sure not to over mix otherwise you will be left with a tough bread. 5. Pour the batter into the loaf tin and try and even it out as much as possible. Place into the oven for around 50mins until golden, skewered the mild with a knife and if it comes out clean it's ready. 6. Allow to cool before cutting and store in an air tight container and eat within 3 days. It's meant to be warm and dry this bank holiday so why not pop into HomeSense and pick up a few things to make your picnic and al fresco eating extra special, plus you never know what your going to find there. My husband is diabetic I wonder if this will be a good recipe for him as it will be naturally sweet. I bought coconut mill gor the first time last week to use in a curry and we all enjoyed it so this may be my next coconut experiment! Sweet coconut bread sounds lovely. I will have to see if it works gluten free style! I LOVE outdoor eating accessories - is that weird? This all looks gorgeous - and that bread! mmmm. It's the first time I hear about coconut bread. It must be delicious. I am loving the Sweet Coconut Bread recipe a lot. Sounds yummy. I think the coconut bread would be perfect for my wife who is coconut obsessed!